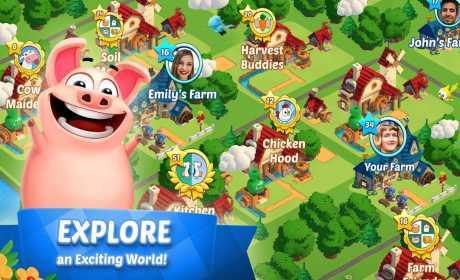 • Plant, grow, harvest, and trade organic corn and more with your friends – the farm of your dreams is about to get made… BY YOU! • Fall in love with the hilarious, lively 3D animals. Your chicken will chill, your sheep will sing and your pig will party. 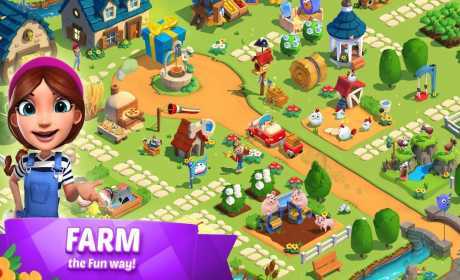 • Customize your land to create the perfect farm paradise for you and your animals to enjoy! • Grow the freshest products and fight back against the industrial corporation, SMOG Inc.! Show them that organic produce is the only way to grow! 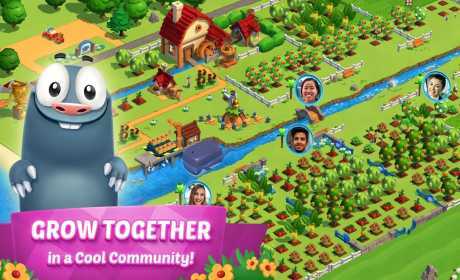 • For the FIRST TIME EVER in a farming simulation, grow delicious fruits at the Community Farm from the awesome apple to the outrageous orange, craft exclusive products together with your friends, send them around the world with Bradley the Whale and share the rewards! • Work with friends in a super social Community Farm where you form a clan to harvest and water each other’s delicious, organic crops. Help your friends and grow together! • Create your own social farming clan with your friends! • Compete with other social Communities in the weekly events and help your farm become the cream of the crop! • Mischievous moles help you harvest faster! • Playful pigs help you at the market! • Beautiful birds fly your orders all over the world! • Munch, your gregarious goat, is always there to offer you fun, helpful advice (when he’s not chowing down on one of your delicious apples…)! • Each animal, from the chickens to the sheep, plays a specific role within your farm to make it the greatest and freshest it can be! Now go grow some fun!